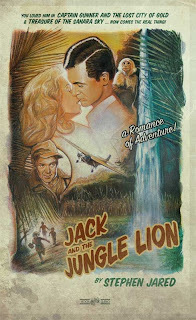 A dim-witted matinee idol, a drunken pilot and a gorgeous movie animal trainer with two young wards crash-land in the Amazon jungle. With nothing but determination to survive, the group battles enormous snakes, angry natives and their own weaknesses in their quest to return to civilization. Will they make it out alive? Will the movie star woo the feisty trainer? Will everyone end up happy in the end? I’m not going to spoil anything for you by saying upfront that the guy does get the girl—it is beside the point. I enjoyed the ride that got me to that happy ending. Jack and the Jungle Lion tells a well-worn story, but the characters really pop. I reveled in the warmth, excitement, and earnest energy of this lively adventure-romance. There are lots of winks and nods to classic Hollywood throughout the story, and Jared evokes lots of familiar "types" from the era. The book itself has the crackle and snap of a thirties comedy. There’s also plenty of the cliff-hanging action of a Saturday morning serial. However, the plot made me think of more recent action throwbacks such as the Indiana Jones series and Romancing the Stone. At 115 pages, Jack and the Jungle Lion was a brisk read. I became fond of the characters—and I hope to see them in further adventures. Stephen Jared is an actor and writer. I recognized him immediately from a series of commercials he’d done for Jack in the Box (remember “Phil in the Box”?). He appears to be equally devoted to each profession—with regular appearances on commercials and television shows and writing projects from screenplays and articles to a children’s adventure story. Check out some of Stephen’s articles here. This guy loves classic Hollywood. For more information on the book, check out the official site for Jack and the Jungle Lion. I love it when novels have winks and nods to classic Hollywood. My friend and author Mark Zero always does that in his books. Great review! I know Raquelle--don't those little references make you feel clever? It's also just great to know there's another classic movie fan out there. Mark Zero--what an excellent name. I will have to check him out.